Please refer to our stock # sorr7Q when inquiring. Robert Sorrell has only created seven of these necklaces, each hand made by him and each slightly different from the other. He calls this his "scarf". Aptly named since, like a cloth scarf, it is versatile and can be worn in a variety of ways--both ends in front, both ends in back, one in front and one over the shoulder, etc. 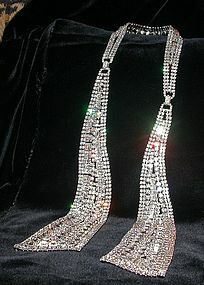 Rhinestones are of the finest quality crystal and the craftsmanship is exquisite! Scarf is 45" end to end and is 3" wide at each end. Sorrell oval name plate is on one end.